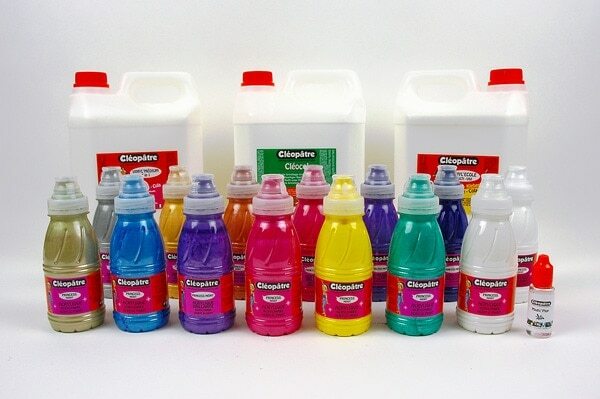 The French brand Cleopatre offers some adhesives which may be suitable for acrylic pouring. We had the chance to test the glue Cleocol, the Vinyl Medium and the Vinyl Ecole for you. Additionally we tested the Magic Plop, the new silicone oil from Cleopatre. The review also included the Cleopatre Princess Merit metallic and pearl colours, which are available in many attractive shades. Cleopatre is a French company based in Ballan Miré (France) specialising in adhesives. The company was founded in 1930 by Monsieur Chamson in Paris. In addition to the various adhesives, Cleopatre has many other products for the handicraft sector in its range. Since 2006, the company also sells acrylic paints, gouache, inks and craft colours. In addition, various lacquers and, most recently, epoxy resins and a resin set are also available. Vinyl Medium is very versatile and can be used as an adhesive, gloss varnish or plasticizer. It should also be suitable as a pouring medium, but is not officially recommended by Cleopatre. Vinyl Ecole is a solvent-free craft gel for children which dries milky transparent. It is also used for the production of “Slime”. Magic Plop is a silicone oil specially developed for acrylic pouring. It should be great for cell formation and generate many large cells. The Princess Merit acrylic paints dry glossy and have a good covering power. They are available in the following colours: pearl white, pearl yellow, pearl pink, pearl turquoise, pearl blue, pearl violet, metallic gold, metallic silver, metallic bronze and metallic copper. We tested the Cleopatre adhesive Cleocol, the Vinyl Medium and the Vinyl Ecole adhesive each with six shades of Pearl or metallic acrylic paints and the new Magic Plop silicone oil. From each Pouring Medium 3 test runs or 3 Pourings each have carried out to avoid coincidences. Of course, we have always carried out all tests under exactly the same conditions. For all pouring media we have prepared the mixtures with a common mixing ratio of 1:1. Plus some water as needed until the optimal consistency of liquid honey has been achieved. In each colour except white we have added 4 drops of Magic Plop (sounds like a lot – but there are also only absolute mini droplets from the bottle). Bepourt we have 25 x 25 cm stretcher frame. In our opinion this is the perfect format for test pourings – not too big, but also not too small to form an objective opinion about the reactions of the materials and their flowability. We have chosen the colours metallic gold, pearl white, pearl pink, pearl violet, pearl blue and pearl turquoise. We used the FlipCup method and layered the cups in the following order: White, gold, pink, violet, blue and green. The Cleocol could be mixed very well with the Princess Merit acrylic colours. We only added a very small amount of water, as the consistency was almost perfect right from the start. There were only very few air bubbles when mixing and the glue is surprisingly low odour. The Cleopatre Princess Merit acrylic paints have a very good, medium viscosity, which is actually optimal for pouring. The colour mixture had optimal flow properties – the consistency of the mixture was 100% exactly as one would wish in acrylic pouring. As far as cell formation is concerned, the use of a butane torch resulted in very fast, extremely numerous, sometimes multicolored, but rather smaller cells. The cells have also been given a fringed look in places. In addition, they run a little into each other and are very densely packed. During the drying process the cells have not changed much and the finish is shiny. Unfortunately, however, during the drying process, what should not happen under any circumstances happened to all the paintings without exception: they were cracked in several places, almost as if the paint had dripped off the canvas. We have to emphasize that we dried the paintings relatively slowly in the cool cellar, where the humidity is higher. This could not have been the reason. But it has to be said that the Cleocol generally dries up quite fast – maybe too fast for pouring and therefore the cracks? Test 1 with the Cleocol produced many small, densely packed cells above the large cells. The cells have a somewhat fringed look. Here the paintings are not yet dry and the cracks are not yet there. In the second test we used the Cleopatre Vinyl Medium together with the Princess Merit Pearl colours and the Magic Plop. The mixture could also be mixed very well, but there were more air bubbles than in test 1. So you should let the mixture rest a little longer before you start the layering. The vinyl medium has a neutral smell and is therefore very pleasant to use. Regarding the flow properties it has to be said that these are really great on the canvas. The consistency of the mixture with the mixing ratio of 1:1 plus a little water is not too viscous and not too liquid – in our opinion perfect. The cell formation has worked extremely well, it is fast, beautiful and clearly drawn cells emerged. When distributing the paint on the canvas, the cells also remained super, I almost didn’t warp at all and didn’t run into each other. The drying process was also relatively fast with the Vinyl Medium, despite careful drying in the cellar. The paintings are very beautiful, dried with a silky shine – they feel almost as if they had already been varnished, so a finish is not absolutely necessary from this point of view. 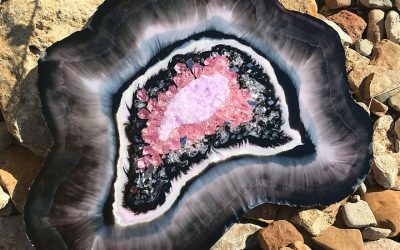 We have also noticed very positively that the colours after drying have a very beautiful brilliance and depth, and the pearl or shimmer effect is extremely effective. Also the cells and/or the drawing did not change at all during the drying process and the color hardly ran off the canvas. Test 2 with the Vinyl Medium has produced very good results. Really exemplary, large and clearly defined cells, and a nice color separation and distribution. The pearl effect is clearly visible even on the wet paintings. The Vinyl Ecole was more difficult to mix with the colours. It had to be stirred much longer than with the other two pouring media and more water had to be added. After adding silicone to the cups, we noticed that “oil eyes” immediately formed on the surface of the silicone oil. So the oil immediately rose to the surface again, although we stirred it in relatively well. We have not observed this with the other media. The flow properties were not optimal (despite the more liquid consistency of the mixture), we had difficulties to get the paint into the corners of the canvas, although we had used more than enough mixture. What also made it more difficult was that the cells warped very quickly when the wedge frame was tilted and the colours mixed more strongly in the other tests. Even when drying, the colors still ran off the canvas and the cells warped all the more. It was also a pity that especially in the one painting, the cells and the colors really ran into each other extremely strongly, that in the end, there wasn’t much of the cells recognizable on the dry painting. Also, the colors mixed to a rather “uniform mush”. The paintings on the Vinyl Ecole are matt dried and the surface is slightly irregular from the haptic point of view. The pearl colours unfortunately don’t show to their best advantage and clearly lose their depth and brilliance. In Test 3 with the Vinyl Ecole a lot of clearly defined cells of different sizes were created – but during the movement of the canvas and the drying process they were very disintegrated. On the third paintings (which we can’t show here… 😉 ) the cells are not recognizable as such anymore. With Cleopatre Glue Cleocol, our conclusion is somewhat ambivalent: Everything would be fine – except that the paintings are cracked. After consultation with the manufacturer, we were told that they recommend a mixing ratio of 1 part medium and 2 parts color, then no cracks would appear. We will certainly test that. However, our opinion is here: mixtures of 1:1 are quite common in acrylic pouring and always a good middle way. Furthermore, a ratio of 1:2 doesn’t work well anymore, as soon as the colors are more pasty. Then so much water has to be added that the colour may lose its intensity and the flow properties suffer. A pouring medium should therefore also be applicable with a mixing ratio of 1:1. If you have to pay so much attention to the mixing ratio, this is unfortunately somewhat tedious in practice. In our opinion, Cleocol is therefore suitable for pouring, but you should stick to the manufacturer’s recipe and ensure very gentle drying. In our opinion, Cleopatre Vinyl Ecole is not ideal for acrylic pouring. Getting nice paintings with good cells turns out to be a rather difficult task. We think it’s a pity that the cells change a lot during drying and the mixture melts on the canvas. We also personally don’t like the matt finish that much. We can totally recommend the Cleopatre Vinyl Medium as a Pouring Medium. It’s really almost perfect – it makes for beautiful paintings with beautiful, clearly defined and large cells. We also liked the shiny and brilliant finish very much. As a little tip: Optionally the Cleopatre Vinyl Medium can also be mixed with Floetrol – for even better results. The Cleopatre Princess Merit Pearl Colours and Metallic Colours surprised us very much. Since they are more in the mid-range price range and not artist colours, we logically didn’t have the highest expectations. But the results are quite respectable: The acrylic colours have a very good brilliance and depth and a really above average pearl or metallic shimmer. We have already seen much worse results from more expensive brands! So we can highly recommend the colours for acrylic pouring to you, especially since the price-performance ratio is really very good here. The Cleopatre Magic Plop is a very good silicone oil which produces very numerous and beautiful, partly really large cells. At least when using the tested pouring media. But we can imagine that it also works well with professional media like Floetrol or Liquitex. We will try that out soon. All tested products were made available to us by Cleopatre. Thank you very much for this. However, this does not influence our opinion about the materials. Although we carried out the tests as objectively as possible, this is still our personal opinion.